David Cameron's mother gave him a £200,000 gift after his father's death which could potentially avoid inheritance tax, his accounts show. In a first for a UK prime minister, Mr Cameron has released a summary of his tax returns from 2009-15 as he tries to defuse a row over his finances. The two £100,000 payments were made a year after the PM inherited £300,000 from his father in 2010, papers show. Ministers said he'd done nothing wrong but Labour said questions remained. Meanwhile, Mr Cameron is to make a statement to MPs on Monday on government measures to tackle tax evasion. In the past six years, Mr Cameron earned a total of almost £1.1m and paid about £400,000 in income tax, according to the three-page summary. Last year, he paid almost £76,000 in tax on an income of more than £200,000. Those earnings included almost £47,000 from a share of rent paid on his family home in west London. Downing Street is providing no details about the £72,000 the PM received for selling "other shares" beyond his investment in his Blairmore Holdings fund or the £40,000 he received in cash from his stockbroking account. 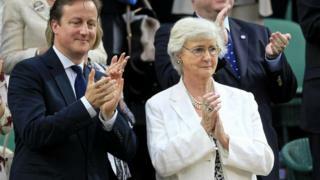 The payments by Mary Cameron to her son in May and July 2011 were given tax free, and will only become liable to inheritance tax of up to 40% if she dies within seven years of handing over the money. Downing Street said the payments were an attempt to "balance" the sums received by all the Cameron children, as Mr Cameron's older brother had inherited the family home. Media captionJeremy Corbyn says that Mr Cameron "still has big questions to answer"
Mr Corbyn said Mr Cameron needed to publish his full tax returns dating back to before he became prime minister in 2010, when he sold off shares in his late father's offshore investment fund for a £19,000 profit. "I want to see the papers," Mr Corbyn told the Andrew Marr show. "We need to know what he's actually returned as a tax return. We need to know why he put this money overseas in the first place, and whether he made anything out of it or not before 2010 when he became prime minister. These are questions that he must answer." Asked about the £200,000 gift Mr Cameron received from his mother, the Labour leader said there was "possibly" a case for looking at inheritance tax rules. Media captionMartin Lewis: "Offshore may be dodgy, inheritance tax planning isn't"
He said: "It does actually reduce the level of inheritance tax that is available for the Exchequer as a whole." Shadow chancellor John McDonnell said the prime minister had "effectively inherited £500,000 from his mum and dad and not paid a penny on it," which, he said, showed there was "something wrong with the system". SNP leader Nicola Sturgeon has, meanwhile, published her tax return for 2014/15, and committed to publishing it annually for as long as she is First Minister. It shows she earned £104,817, and paid more than £31,000 in tax. Scottish Labour leader Kezia Dugdale was the first Scottish party leader to publish her tax returns, on Saturday, and was swiftly followed Ms Sturgeon, the Conservatives's Ruth Davidson and Lib Dem Willie Rennie. Inheritance tax is paid if a person's estate (their property, money and possessions) is worth more than £325,000 when they die. The rate is 40% on anything above the threshold. Married couples and civil partners are allowed to pass their possessions and assets to each other tax-free. The deceased's estate may not have to pay inheritance tax on assets the deceased gave away as gifts while they were alive. The original owner must live for seven years after giving the gift. One person's tax planning is another person's tax avoidance - so whether David Cameron's tax affairs are controversial or not is really a matter of where you stand on the payment of tax. Most tax accountants would advise a wealthy family on "gifts" - payments of money - to their children and how to ensure they are not liable for inheritance tax by making payments in tranches to avoid breaching tax thresholds. Mr Cameron's family appear to have done this, and Downing Street says the payments were made by the prime minister's mother to "even out" the inheritance payments made to her children following her husband's death. Not to avoid tax. Mr Corbyn, who has promised to publish his own tax returns "very soon", also suggested Britain needed to be "much more assertive" on the question of overseas arrangements in the UK's overseas territories and asked why Britain was "encouraging" tax havens. And he said greater openness around tax affairs might be expected from all those in public life, not just MPs, in future, saying: "I think we're moving in that direction". The SNP are, meanwhile, calling on Mr Cameron to publish a financial statement on all government ministers, including Chancellor George Osborne, revealing whether they have benefited from offshore tax havens. A Treasury source said: "We have been clear that the chancellor has never had any offshore shareholdings or other interests. "His income and interests are straightforward and declared publicly: his salary, rental income from a property in London and a shareholding in his father's firm, Osborne and Little. "He is always happy to consider ways to offer even more transparency." Energy and climate change secretary Amber Rudd defended the prime minister on the Andrew Marr show, saying Mr Cameron had "said all there is to be said" about his tax affairs, having taken the "unprecedented step" of publishing details. She said Mr Cameron and his family had done nothing wrong and had paid the correct amount of tax due, adding that going after tax havens had been a "key priority" for the government since 2010. Mr Cameron has also announced a new task force to investigate tax-dodging allegations arising from the leak of 11 million documents from Panamanian law firm Mossack Fonseca, known as the Panama Papers. The prime minister was dragged into the controversy when it emerged his late father's investment fund, Blairmore, was a client of the firm. Downing Street issued a series of statements over four days as pressure on Mr Cameron mounted before he finally admitted he had benefited from the fund. On Saturday, he admitted he could have better handled the row over his financial affairs, telling people to "blame me" for the slow response, not Downing Street officials. He said he was publishing the information on his income to be "completely open and transparent". The prime minister's salary was steady at £142,500 from 2010 to 2015, but there were tax variations due to treatment of his pension contributions and the different approaches to his £20,000 tax-free allowance. In terms of rent earned on the Notting Hill house, Mr Cameron's 50% share, minus expenses, was £45,041 in 2011-12, £46,700 in 2012-13, £47,764 in 2013-14 and £46,899 last year. The new tax task force announced by Mr Cameron will have initial funding of £10m and involve staff from the Serious Fraud Office and Financial Conduct Authority as well as HMRC and the NCA. The government said the agencies had leading technology, experts and resources to tackle money laundering and tax evasion. Mr McDonnell said proposals for the task force to report to the chancellor and home secretary were "unacceptable". "Any inquiry must be fully independent and in public," he said.